"Many microorganisms of diverse phylogenetic beginnings have adapted to intracellular life, each in its own unique way, and sometimes remarkable resemblances in behaviour among intracellular parasites are best ascribed to convergence in similar intracellular habits rather than to divergence from a common origin. Finally it should be remembered that adaptation to intracellular life, although by no means rare, is not easy. After all, most parasites still live extracellularly". James W. Moulder (1985) Comparative biology of intracellular parasitism, Microbiological Reviews 49, 298. 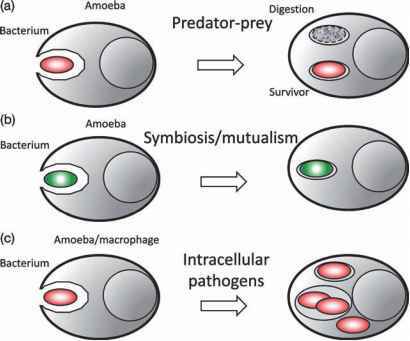 Figure 1.3 Drawings depicting the hypothetical transitions from bacteria falling prey to amoebal predators (a) to symbionts or parasites in amoeba (b). (c) The latterthen give rise to intracellular pathogens of multicellular organisms including humans. This was due to preadaptations selected and sharpened during interactions with amoebal hosts. cidal macrophages. These bacteria have the potential to become either pathogens of cold-blooded animals (e.g., M. marinum, a natural pathogen of fish and amphibians) or, when able to replicate at 37 °C, pathogens of mammals (e.g., L. pneumophila). L. pneumophila is a prime example of how a prey of freshwater protozoa became a parasite within a unicellular host and thereby gained the prerequisites - or preadaptations to stay with the terminology of evolution biology - to survive inside mammalian phagocytes and become a pathogen (see Chapter 18). Legionella apparently benefited from the fact that mechanisms and factors of phagocytosis and intracellular trafficking are highly conserved throughout the animal kingdom. In principal, this allows intracellular bacteria to parasitize any phagocytic cell in the world. L. pneumophila lives in fresh water, especially artificial warm water distribution systems. When inhaled, it can cause a severe pneumonia called legionnaires' disease in immunocompromised and elderly patients. This pathogen seems to have a complex lifestyle which is regulated by nutrient availability and characterized by distinct gene expression patterns and switching from flagellated free forms to intracellular nonflagellated and spore-like stages . Inside amoebae and macrophages it survives and proliferates in compartments made of endoplasmic reticulum (ER) membranes (see Chapter 18) . It has been suggested that during coevolution between Legionella species and protozoa the bacteria acquired a significant number of eukaryotic-like genes that are not found in most other bacterial genomes and that are possibly involved in protein-protein interactions with host cell structures [30-32]. Interestingly, the L. pneumophila genome contains an unusual number of ankyrin-like domains as well as F-box and serine/threonine protein kinase genes. Eukaryotic ankyrin repeat proteins are typically involved in protein-protein and protein-cytos-keleton interactions. F-box proteins play a role during ubiquitination, and protein Ser/Thr kinases are eukaryotic signaling molecules. It is fascinating to note that other intracellular pathogens share these genomic features of L. pneumophila. Wolbachia, Coxiella and Rickettsia species also carry ankyrin-like domain genes, and M. tuberculosis and the extracellular Yersinia pseudotuberculosis have Ser/Thr protein kinase genes involved in their virulence . Homologs of these genes are found in protozoa, suggesting that these virulence traits may have been gained through lateral transfer ofprotozoan genes, thereby preadapting Legionella to become a mammalian pathogen . It will be interesting to find out whether other mammalian pathogens that dwell within protozoa, such as M. marinum, M. avium, Listeria monocytogenes, Francisella species or B. pseudomallei, have developed similar virulence features during coevolution with ancient predatory protozoa. 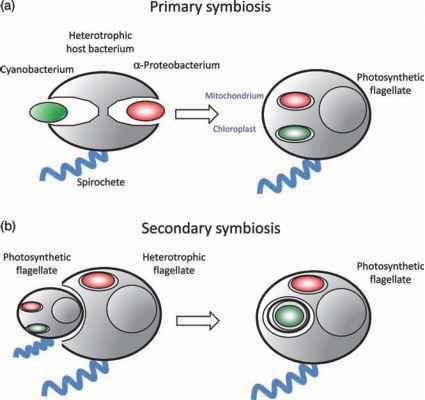 Unlike specific pathogens, these ubiquitous and opportunistic organisms require a broad genetic flexibility to thrive in different environments. Unlike other bacterial genomes, over 7% of the L. monocytogenes genome encodes regulatory proteins, whereas the similar-sized genome of the extracellular pathogen S. aureus has half as much regulatory DNA. This suggests that L. mono-cytogenes needs flexibility in its gene regulation in response to sudden environmental changes . Development of the L. monocytogenes PrfA-regulated virulence gene cluster, which is essential for intracellular survival and spread from cell to cell, was an important prerequisite to becoming an intracellular pathogen in mammals (see Chapter 24). Interestingly, this gene cluster is also present in the nonpathogenic L. seeligeri, a close relative of L. monocytogenes but does not (yet) give L. seeligeri the license to become a mammalian pathogen. However, it has been suggested that it may allow freshwater listeria to survive in invertebrate hosts and, therefore, the PrfA system may represent an ancient preadaptation to becoming a pathogen . It is also noteworthy that intracellular pathogens are rarely found in higher plants. This may be either because of the robust plant cell wall, which restricts entry or because of the inability of plant cells to phagocytose. The enigmatic protists of the order Plasmodiophorida, such as Plasmodiophora brassicae and Spongospora species, are intracellular plant pathogens of economical importance . Although these microbes have recently became a focus of more detailed genetic studies, an understanding of the invasion pathways, intracellular survival and niches of these pathogens is still lacking.